If you're building cabinets, and you aren't familiar with medium-density fiberboard, then it's time to get acquainted. 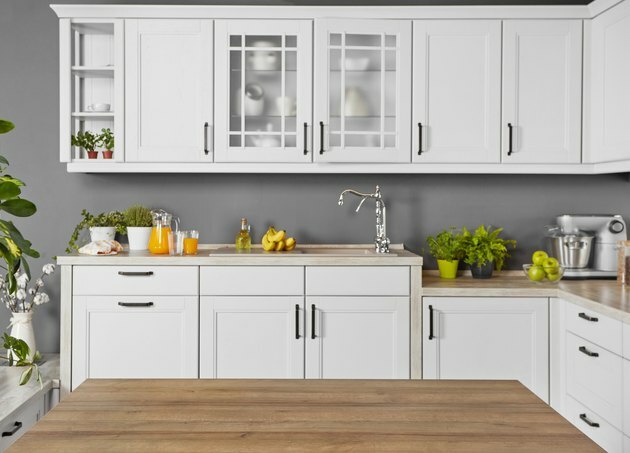 MDF is one of the best materials you can use to fashion cabinets and make cabinet doors, but if you're encountering it for the first time, you need to know a bit about it before you use it for a project. Even if you've worked with it before, it pays to refamiliarize yourself with its idiosyncrasies. What's So Good About MDF? You'll find MDF at any lumber yard or big-box store. It comes in 4-by-8 sheets and in thicknesses from 1/4 to 3/4 inches. You'll want 5/8- or 3/4-inch material for cabinet doors. This stuff is heavy, so you'll need help to load full sheets into your vehicle and to carry them around your workshop. The reason MDF is so heavy is that it consists of a densely packed mixture of resins and wood fibers. It's similar to particle board, but the pressure used to compress it is much higher. MDF isn't the densest material on the market – that distinction belongs to high-density fiberboard, or HDF – but it is significantly denser and heavier than particle board, plywood or hardwood. The composition of MDF is responsible for two of its main advantages over wood and plywood. The first is that it is completely stable and will never warp. Unlike plywood, it has no layers that can delaminate and separate. The second advantage is that it has no wood grain, so you can get a glassy, smooth finish. That's a definite bonus when making cabinets or cabinet doors. Don't Want to Do the Job Yourself? Working with MDF may not be up your alley if you're sensitive to wood dust mixed with toxic glue. If, for this or another reason, you decide to hire someone to build the doors, look for a professional woodworker with a shop and good references. Unless you want uncomplicated slab doors, the job is probably too painstaking to do onsite with a circular saw, even for a pro. You may be satisfied with less-than-top-drawer results if you're building the doors yourself, but if you're paying to have them made, you want only the best, and it takes a shop with a cabinet-grade tools to achieve that. The weight and composition of MDF create certain challenges. It's worth meeting these challenges given that MDF is a low-cost material and that it provides an ultra-smooth surface when painted. Keep in mind that unless MDF has a veneer, you always have to paint it. Cutting MDF: If you try to cut MDF with a utility blade, you'll chip the edges. Instead, use a blade with a minimum of 40 teeth. A carbide-tipped, 80-tooth plywood-cutting blade is best. Wear a dust mask and goggles because MDF creates copious amounts of dust. Fastening MDF: You can fasten MDF with finish nails, staples or screws. Drive nails and staples with a pneumatic nailer, not a hammer. Always drill pilot holes for screws and countersink these holes. Otherwise, the material will probably chip out when you sink the screw head. Drilling MDF: Operate the drill at high speed when making holes with a spade bit or a conventional boring bit. If the bit spins too slowly, it will chip out material from around the edges of the hole. Sanding MDF: You generally don't need to sand the face of anything you make with MDF, but you should sand edges before you paint them. You can do this by hand with 100- or 120-grit sandpaper. Handling MDF: Edges crush easily, so don't drop MDF on the ground. Never allow unfinished MDF to get wet. The fibers will swell. Because of the hardness of the resins that bind the fibers, MDF dulls saw blades quickly, so it is good to have an extra blade on hand. The dense material is also hard on router bits and drill bits. You can make cabinet doors out of MDF even if the cabinets are made of plywood, wood or some other material. MDF always has to be painted, but you can choose a color that blends with the cabinet material, even if it is stained or unstained wood. The simplest design consists of flat panels. They can fit over the openings with a 1/2- to 1-inch overlap on all edges, or they can fit inside the openings. If you choose the latter option, you will have to be more careful with your measurements. Add a design touch by routing the edges of the panels, which works best if the doors overlap the openings. A common technique is to round the outside edges of the panels with a roundover or ogee bit and use a cove bit to create a finger grip on the inside bottom edge. Routing MDF board this way eliminates the need for handles. You can add trim to the panels by nailing or gluing wood molding to the surface edges. For example, create DIY MDF Shaker cabinet doors by gluing flat molding (which can be wood or MDF) to the outside edges of each panel. Embellish the inside edge of the molding if desired by routing it with a roundover bit or tacking on decorative inside-corner molding. You don't absolutely need a table saw for cabinet door fabrication, but it is highly recommended. Any slight wavering on the edges of the doors will be instantly noticeable, so you need straight cuts. If you don't have a table saw, set up a guide for your circular saw with a straight edge and a pair of clamps. Measure the length and width of each opening with a tape measure. When making doors that fit inside the openings, don't assume that the dimensions of all the openings are all the same. Keep track of any small differences when cutting the doors. Start by ripping a full sheet into workable pieces on a table saw or on a work bench using a circular saw. For your own safety and to prevent damage, make sure your table saw has an out-feed table to support the heavy material as you push it through. Rip and cross-cut these smaller pieces into panels that conform to your measurements using your table saw or circular saw. Rout the edges of the panels or add trim according to your design plan. If you have decided to rout the edges, it is best to do it with a router table. If you have to do it with a hand router, hold the panel down with clamps and always move the router against the blade rotation to avoid losing control. If you decide to add trim, the best way to attach it is to spread carpenter's glue on the back, lay it in place and nail it with a pneumatic brad nailer. Position the hinges on the edges of the door panels and drive the screws to hold them in place. If you are using spring-loaded cabinet hinges, you will need to drill insets for them with a 1-inch or larger spade bit. Hold each door in place on the cabinet, level it with a torpedo level and attach the hinges to the cabinet. Verify that each door is straight. Try it to make sure it opens and closes smoothly, and then take it down and remove the hinges. Sand the edges of the doors by hand with 100- or 120-grit sandpaper. If you installed molding, fill the nail holes and the gaps between the molding and the door panel with spackling compound or some other filler. Drywall joint compound makes a highly workable, stable filler if you have some on hand. Sand the filler by hand when it dries. Prime the doors, especially the edges, with shellac- or oil-based primer or lacquer sanding sealer. Wait for it to dry, and then scuff it with 220-grit sandpaper. Apply at least two coats of enamel or lacquer. If you are after a super-smooth finish, you will want to spray or roll. You can spray with spray cans or with spray equipment. Whichever application method you choose, don't forget to scuff between coats. Stand the doors against a wall with newspaper underneath them to dry. Set the hinges back in place, attach them and hang the doors. If you're installing handles, measure their positions with a straight edge and tape measure and make a mark for each one. Use a level to verify that the marks on adjacent doors form a horizontal line before drilling the holes and installing the handles. Spring-loaded cabinet hinges are great for keeping the doors closed, but if the doors tend to slam, the noise can be disturbing and the impact of the door against the cabinet facing can cause chipping. Prevent this by adding rubber bumpers to the back of each door. Rubber bumpers are usually round and about 1/2 inch in diameter. They are self-sticking and easy to apply. Place two on the outside edge of each door – one on the top corner and one on the bottom. If you don't use spring-loaded hinges, it is a good idea to install some kind of latch on each door to keep it closed. Magnetic, flex-grip and roller latches are three of the many types you could choose. Consider child-proof latches that lock from the outside of the door if you have small children or if you live in a seismic zone, such as California. In the event of an earthquake, the latches will keep the doors closed and prevent the contents of the cabinet from spilling onto the floor. Once your MDF cabinet doors are in place, the most important maintenance tip to remember is to keep them dry. A small amount of condensation is OK as long as you wipe it off periodically, but prolonged exposure to moisture can damage the finish. If the finish deteriorates and allows water to penetrate to the MDF itself, the fibers will swell, and there's no way to undo this type of damage. You'll have to replace the affected doors. Remember that the edges of MDF are vulnerable to impacts. If you repeatedly strike the edge of a kitchen cabinet door with a plate or bowl, the MDF is bound to chip. Again, the only realistic fix is to replace the door. Keep the doors clean by periodically wiping them down with dish soap and water and drying them with a separate rag. If you need a stronger cleaner, use ammonia or add a little vinegar to the soap/water solution. Vinegar is a mold disinfectant and is recommended in high-humidity environments that allow mold to flourish. It won't damage paint or finish as long as you remember to wipe each door dry immediately after washing it.